Every year, graduate students from each UC campus gather in Sacramento to educate lawmakers about the importance of graduate research and its contribution to California’s economy and progress. March 21, 2018 marked the ninth annual Graduate Research Advocacy Day. Twenty-six students representing the 10 UC campuses were selected by their graduate deans as advocates for the research being done by graduate students across the state. The students and deans met with legislators from their local districts to advocate on behalf of UC graduate studies and research. This year, as part of UC's 150th sesquicentennial celebration, legislative members and their staff were also invited to a UC Grad Slam Showcase where six students gave bite-sized briefings on their research. Their presentations were on key issues facing California and included latest advances in online education, managing fisheries in an era of climate change, super-charging solar battery storage and how to combat student anxiety and depression with a simple technology tool. 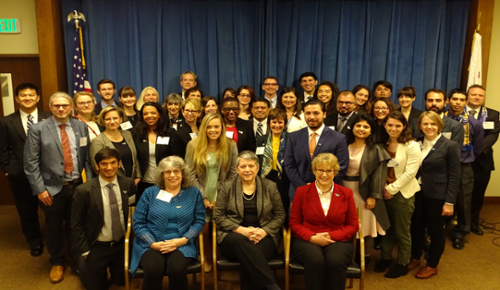 In addition, UC President Janet Napolitano joined the delegation to advocate for the importance of graduate research and public higher education.